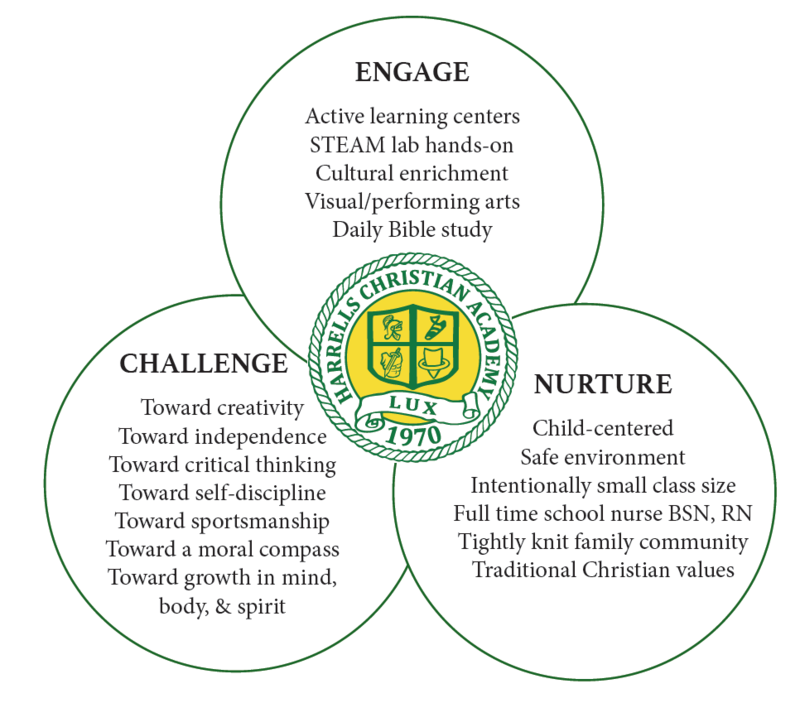 Harrells Christian Academy has almost 50 years of experience and nearly 50 acres of classrooms, laboratories, artistic spaces, gymnasium spaces, fields, and an auditorium. HCA's teachers have many years of experience and our families have been involved and commited to the school for generations. All of these things provide the perfect environment to ENGAGE your son or daugther through real relationships that build all aspects of the student - heart, mind, body, and soul. Thoughtful curriculum, opportunities for electives and leadership positions, prayer and devotion, communtiy service, athletic programs, and a vibrant college-counseling program are in place to CHALLENGE your son/or daughter to be the best version of himself/herself. A dedicated, Christian faculty who actively prays for their students, opportunities of academic tutoring and extra help, a full-time school nurse, space in the school day for spiritual reflection, and the opportunity to grow through service will NURTURE your son or daughter.